Pro-democracy forces brought tens of thousands of protestors into South Africa's streets last week following President Jacob Zuma's ousting of Pravin Gordhan from the Finance Ministry and his replacement with Malusi Gigaba. 'I don't ask questions. I simply comply with the instructions given to me', said Gigaba on being appointed. This marks the fifth change in finance minister in two years. 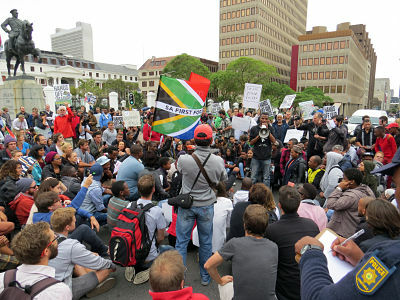 On 18 April, a vote of no-confidence in President Zuma is due to be held. He is expected to win comfortably, although much will be read into the size of the winning margin. Among the most stubborn collateral damage wrought by the West's financial crisis of 2008 was the cutting of international credit lines to Africa. The initial rationale for severing the lines was knee-jerk and computational: if Western banks and ratings agencies had failed so badly, African banks would probably have made the same errors. In fact, some African financial institutions have demonstrated much higher prudential standards than their Western counterparts. Doubtless the cumulative effects of the 2008 crisis were to push down commodity prices and with them, the revenue of many African governments. A boost for African banks has been the fast-growing relationship between them and the private and state financial institutions in Asia's key economies, such as China, India, Japan and South Korea. Along with higher foreign reserves and more robust monetary policies, that provided Africa's state treasuries and banks with something of a cushion. But the failure to resolve many shortcomings in the West, together with the slowdown in emerging markets, is redoubling their impact on Africa's banks. Most of all, this is felt in more sharp cuts to the number of international credit lines that African banks can access. This quickly hits the local economies, particularly in East Africa currently, slowing down trade and production. The credit line crunch should be a leading topic at the African Development Bank's annual meeting next month. Human rights campaigners and a main opposition party are targeted by a severe crackdown overseen by President Ismaïl Omar Guelleh amid apparent international indifference.